Gary was born August 29, 1948 in Peoria, Illinois to Clifford and Phyllis Burkholder. He graduated from the Mabel High School. He worked at various places including IBM in Rochester and different business adventures. On April 21, 1973 he married Coralee Leqve. She later passed away from cancer. Gary enjoyed volunteering and was awarded the Minnesota JC of the year and received the Outstanding Volunteer award for the DAV. 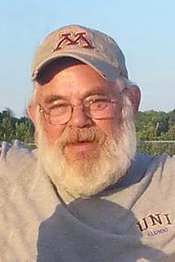 He enjoyed hunting, fishing, making people laugh, helping his Amish friends get to appointments and deliver their furniture, and mostly he enjoyed his grandchildren. Gary was willing to help anyone in need. Gary passed away Monday, April 2, 2018 at Traditions in Preston at the age of 69. Gary is survived by two sons Vaughn and Robert (Ingrid) both of Rochester; grandchildren Alexa, Hally, Chase, Teagan, and Gunner; and two brothers Richard (Sue) of Peoria, Illinois, Ronald (Sandy) of Casa Grande, Arizona. He was preceded in death by his wife Coralee, and his parents. Memorial services will be 11 AM Saturday, May 12, 2018 at the Harmony United Methodist Church. Burial will be in the Big Springs Cemetery. Visitation will be 9-11 am prior to services at the church.